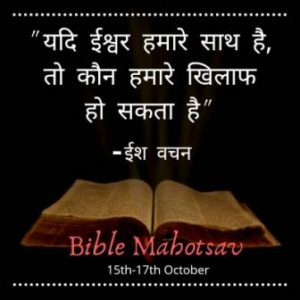 PATNA (Bihar): On Monday evening (15th October) Over three thousand Catholic delegates and participants from all over South Bihar are expected to converge at the Queen of Apostles Church in Kurji for ‘ Bible Mahotsav’ the grand celebration that ends the year-long ‘Year of the Word of God’. It will be recalled that Archbishop William D’souza SJ of Patna had declared a year- long observance in all Catholic Parishes, for the faithful to study on the themes of the Gospels. At different times during the past 12 months, parishes in different towns have held celebrations, quizzes, variety programs and special prayer services to mark the importance of the Bible in Christian life. “It’s a celebration of thanksgiving to God for the gift of the Holy Bible to the Catholic Church and the blessings we have received in and through the reading and celebrating the word of God.” says Archbishop William D’Souza. The PRO of the Bihar Regional Bishops’ Council and the Parish Priest of the Kurji Church, Fr. Raymond Cherubim, SJ said that, on October 15, at 3:30 PM, the Bible Mahotsav will be inaugurated at Hartmann School grounds in the premise of the Catholic Church Kurji, with Archbishop William D’Souza SJ as the chief celebrant. A grand procession with the Holy Bible enthroned on a ‘palki’ will ensue from the Church ground towards St. Michael’s Primary School, with Catholic girls and boys as well as youth members leading the way. The festival is for Catholics and Christians to better understand and live their lives in the light of the universal message of Peace, Reconciliation, and Love for all, as enshrined in the Bible. An hour long prayer service will be conducted, led by the educationist and Couples for Christ member Mr AV Jose and his team. At 6 pm, the Patna Catholics (Notre Dame, Kurji Holy Family Hospital and Kurji Parish Youth) will present a variety cultural programme on Biblical Themes. On October 16, the day starts at 6:30 am with a series of prayer sessions. The highlights of the Day are Holy Mass led by Coadjutor Bishop Sebastian Kallupura at 10:45AM in the church, a Bible Quiz on the Gospel of St. Luke, and a variety cultural show by the visiting delegates from different Parishes of South Bihar, at St. Michael’s Primary School. October 17 is the concluding day, beginning with the Bible procession to the Church. The concluding mass will be led by Archbishop William D’Souza SJ at 10.45 AM. One Response to "Bible Mahotsav Today: Celebrating the Peace and Harmony in Scripture"
Looking forward to seeing the celebrations and the cultural program.